Samuel Doster was born in Indiana in 1925 and moved with his family to New Castle while he was a child. They lived in the only house on the 1000 block on West State street, which they shared with a number of others. His mother hosted Baptist prayer band meetings on Monday afternoons. 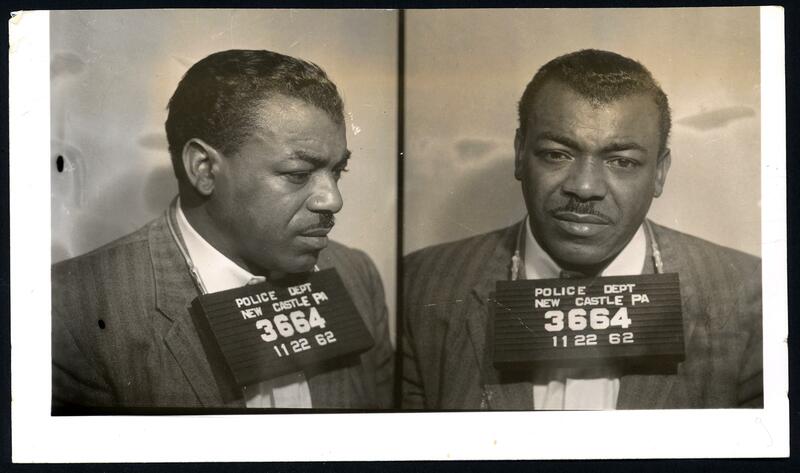 In 1941, when he was sixteen, Samuel was arrested for larceny. He was processed by the police, who took his mug shot and filed it away with his details, but was discharged without penalty. Two years later, he was drafted. He survived the war comfortably, spending the last year of his service in Hawaii. On his return to New Castle, he got married and went to work in the Johnson Bronze factory. Within months, his marriage was in trouble, and he moved out of the house soon after his first child was born. Samuel spent time organising charity events for the YMCA and became active in his trade union. When a new auxiliary police force was set up, Samuel volunteered for that, too, and was eventually promoted to sergeant. By 1953, he had remarried. That summer, he and his new wife, Evelyn, were among the three thousand people who attended the annual Shenango Pottery picnic in Cascade park, where children were given free access to the rides, entertainment was provided by an employees’ talent show, and he and Evelyn won first prize in the waltz contest. The Korean war ended the next day. The sun shone all weekend. On a Friday night in August 1962, Samuel and two friends went to the colored Elks club on Home street, arriving just after midnight. Around three o’clock, Samuel and John James, Jr, the son of a cruiser patrolman in Farrell, got into an argument about how many Negroes had been employed by Johnson Bronze during the war. A wager was made, and Samuel placed a $10 bill on the bar. John James left the club while Samuel was talking to one of his friends. Samuel noticed that the $10 was missing and followed James into the street. James told him that the bartender had taken the money. Samuel went back in to check, but the bartender said he hadn’t seen it. Samuel went back outside and stopped James getting into his car. He took him back inside the club and James pulled out a razor and grabbed a microphone, which he swung at Samuel. James ran out of the club, followed by Samuel, who chased him down Home street onto Moravia street and into the space between two buses that were parked at a service station, where they tumbled to the ground together. Samuel opened his clasp knife and he and James grabbed for each other, falling into a bear hug from which James broke loose only after Samuel had stabbed him once in the shoulder and twice in the back. James ran to the service station office, followed by Samuel. Both insisted that the police be called. A police cruiser took them to the hospital, where Samuel was released after being treated for a cut to his thumb. After dropping his knife into a mop bucket—“because”, he told police later, “I knew I was going to get into a world of trouble behind it”—he filed an aggravated assault charge against James, who was kept in the hospital for treatment. James died the following afternoon. Samuel’s knife had severed an artery and James had been bleeding internally all night without anyone noticing. Samuel was at a dance in Cleveland with Evelyn when he heard the news. He returned to New Castle and turned himself in to the police, who replaced their mug shot of the sixteen-year-old Samuel with one of the thirty-six-year-old Samuel and wrote “Murder” on the file card, under the old charge of larceny. Samuel was found guilty of voluntary manslaughter and sentenced to two to four years in the Western penitentiary. While he was inside, Evelyn divorced him. Upon his release, he moved in with his mother, back in the house where he had grown up. A year later, Evelyn took him to court to force him to pay child support. Eventually, Samuel moved out of town. He died in Columbia, South Carolina, in 2000, at the age of seventy-four. Sources: New Castle News (31 April 1940, “Monday Prayer Band”; 1 Nov 1943, “City Board Names Selectees”; 27 May 1947, “Marriage Licenses”; 28 Oct 1947, “Young Woman Missing”; 15 Oct 1947 “Shenango Y Phalanx Card Party Saturday”; 9 March 1950, “Sixty not True Bills Returned”; 16 March 1953, “Auto Workers Local Announces Results Of Sunday Election”; 27 July 1953, “Pottery Picnic Attended By 3500 Persons”; 22 Feb 1956, “Ten Promoted By Auxiliary Police Group”; 5 Jan 1955, “Several Score Get Police Instructions”; 26 Nov 1962, “Murder Charge In Stab Death Of Farrell Man”; 21 June 1963, “Manslaughter Ruled By Jury In Doster Case”; 30 Jan 1964, “Samuel Doster Given 2-4 Year Prison Term”; 13 Jan 1966, “15 Divorces Granted By County Court”; 9 Sep 1967, “5 Defendants Plead Guilty”). You are doing such a beautiful job here. I always love it. I feel the whirlwind of time spinning wildly, crazily, relentlessly. But strangely unnoticed. The writeup was outstanding. You have a wonderful style. It will be interesting when one of the relatives/friends shows up and gives us their take. They have to be out there. Sorry if I offended you, Macelia — I think I might not have understood your first comment. I didn’t know what “RIH” meant, so I looked it up and the only meaning that I could find that made sense was “Rot in Hell”. I guess you didn’t mean that. I apologise. Could you maybe tell me what you meant by RIH? I’m glad we got that misunderstanding cleared up! Best wishes to you and your family. Another good one — maybe my favourite yet. Much appreciated, and enjoyed.